This collection of essays is a reply albeit late to the publication, twenty years ago, of John Morrill’s significant collection of essays The Nature of the English Revolution (1993). The Russian Marxist Leon Trotsky was fond of saying that "every sociological definition is at bottom a historical prognosis." When John Morrill stated that “the English civil war was not the first European revolution but the last of the wars of religion he was in this statement forming a historical prognosis of the English revolution that has stayed with him all his life. This current volume of essays was written by former students, colleagues, and historians who have collaborated with Morrill and broadly support Morrill’s historical viewpoint. While not all essays break new ground some like John Walter’s and Phillip Baker do. It is also evident that this volume of essays will provoke further work on their related topics. 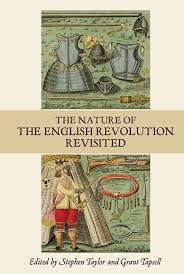 There have been two interrelated developments that have characterized the historiography of the English Revolution over the last few decades. The first one has been the systematic and protracted attack on Marxism in the form of hostility to the method of historical materialism. The second one and a by-product of the first has seen the demise of a “grand narrative” as regards the English revolution. The theory that England passed through a bourgeois revolution during the seventeenth century was primarily championed by historians Christopher Hill and to a certain extent Brian Manning. The rejection of this theory has led to an increasingly specialized field of study and with it the adoption of a lower narrative. An approach conducted by John Morrill and his book Revolt in the Provinces: The People of England and the Tragedies of War, 1630-48. The current essays lay the groundwork for a further continuation of Morrill’s life work. This recent collection of essays gives us an excellent opportunity to examine the state of seventeenth-century English historiography, especially the contemporary post-revisionist historians. Charles I and Public Opinion on the Eve of the English Civil War (pp. 1-26) by -Tim Harris. Harris, who is perhaps best known for his work on the Post-Restoration period examines the formation of a Royalist Party. When we talk about a party, we cannot compare a 17th-century structure of today’s political parties, but nonetheless, the Royalist party did begin to take on certain characteristics that we are familiar with. One of these being the use of propaganda which the king saw as a valuable tool against his enemies. As Harris points out the early use of this against the Scots did not work out too well. Harris’s chapter is something of an attempt to reevaluate and rehabilitate Charles. There is a view among contemporary post-revisionist historians that it is important to concentrate on the king’s strengths as opposed to his weakness of character. I am not sufficiently convinced that you could say the Royalist forged a coherent ideology. But if they did Harris tends to divorce it from its economic base. Harris also does not investigate what social forces the disparate groups who fought for the king represent. Harris also rejects the conception of a long-term cause of the war. The attack on this design was begun by G R Elton has led to some historians believing that things went disastrously wrong for Charles by no fault of his own. Harris belongs to the camp of historians who include Kevin Sharpe who regard the personal rule as a period of constructive and welcome reform in England. Chapter 2 Rethinking Moderation in the English Revolution: (pp. 27-52)-Ethan H. Shagan. Ethan Shagan, in an article closely related to his recent book admits that it does seem paradoxical that in the midst of the bloodiest and revolutionary conflict England had ever seen all parties both left and right sought the mantle of moderation. Much of this moderation was a smokescreen to hide very controversial political opinions. Take for instance the Levellers. Their main publication was called the Moderate, but in reality, their political program called for a wider franchise, a revolutionary act if there ever was one. Summed up by the outlook of Col Thomas Rainsborough “I think that the poorest he that is in England hath a life to live, as the greatest he “; is an extraordinary call for social equality, given that the only people who could vote were a tiny section of the population. In many ways, this chapter more than most reflects current historiography to downplay the revolutionary actions of the leading participates of the revolution. The killing of a king, the establishment of a republic and to top it all a coup d'état by the New Model Army are not the actions of reasonable men. Wales essay is firmly in the spirit of John Morrill. He examines the bitter political and religious conflicts within Norwich in the middle 1640s. There is nothing wrong with exploring local political events as long as they reflect wider socio-political goings-on. Wales chapter does not examine the connection between politics and economy. Wales correctly states that the English Revolution was a pivotal moment of how the poor were treated in England. This period saw the escalation of taxes to fund poor relief that lasted well into the restoration period. While focusing on Norfolk Wales study could a template for other areas of the country. Amongst conservative historians, there have been two trends when it comes to the poor in the English Revolution The first is either to ignore them completely or to downplay any form of politicization or radicalization. On the other side of the coin, there has been a tendency amongst the more radically minded historians to exaggerate their role and in some cases equate them with a 20th-century proletariat. This is not to say that there was no “revel, riot and rebellion” during the English Revolution but it was not on the scale of the French or Russian Revolution after all the 17th Century revolution was a bourgeois revolution, not a proletarian revolution. On the other hand, it would be foolish to ignore the significant radicalization of the poor during this time. There was a general heightened class consciousness amongst a growing section of the population, and for a while, this alarmed the authorities. Most of the historians who have written essays in this book would reject the quote used by Hill as a too social determinist. In fact, the main characteristic of the modern conservative historians has been there almost Jesuitical separation of politics from economics. As the Marxist economist, Nick Beams eloquently states “One of the most frequently employed caricatures of Marxism is the claim that it argues that ideology is just a cover for the real economic motivations of social actors. Accordingly, Marxism is “disproved” by the discovery that individuals act, not according to economic motives but by dominant ideologies. Marxism does not deny that historical actors are motivated and driven into action by their ideological conceptions, and it does not claim that these ideologies are merely a rationalization for the real economic motivations. However, it does insist that it is necessary to examine the motives behind the motives—the real, underlying, driving forces of the historical process—and to make clear the social interests served by a given ideology—a relationship that may or may not be consciously grasped by the individual involved”. John Walter’s essay is a useful barometer of class relations during the English revolution. His examination of the use of gestures indicates a growing radicalism amongst the middling sort and sections of the poor. The question of ‘‘hat honour’’ is important in that the refusal to take one's hat off in the presence of a superior person was seen as the height of political opposition. I agree with one writer who said this is a “very penetrating essay; John Walter discusses the body language that reflected the lack of deference paid to figures of authority and status during this period. I think this a critical point, as it struck at the very heart of traditional English society. Turning one’s back or refusing to doff one’s cap were tremendously symbolic actions. Walter does an excellent job in calling attention to this relatively unexplored subject. One is reminded of the story that King Charles II took his hat off in a conversation with the Quaker, William Penn, saying that someone had to doff their hat in the presence of a king”. The question of the Levellers is one of the most contentious issues arising out of the English revolution. Morrill wrote little on them, and his views on the Putney debates are well known in that he thought that no Levellers were there. Morrill argues that Leveller rhetoric was fundamentally opposed to a standing army and that Lilburne’s experience made him suspicious and out of touch with its rank and file. While Baker sees the Levellers as radicals not revolutionary his work is important in so much that it contributes significantly to our further understanding this group. The central plank of the Levellers manifesto was the call for a democratic republic in which the House of Commons would be more important than the House of Lords. A Leveller would have a wanted redistribution and extension of the franchise, legal and economic reform on behalf of men of small property, artisans, yeoman, small merchants, and the very layers, which made up the composition of the Levellers themselves. But as Baker points out there was a limit to the extension of the franchise. The poor in the 17th century and this contains a large section of the population would not be given the vote. This does not undermine the revolutionary implications of the call by the Levellers to widen the franchise. In total, there are eleven essays in this book. The ones missed in this review will examine at a later date. The articles are well written and researched, and some do break new ground and explore new trends in post-revisionist historiography.The one area that certainly does need far more extensive research is the debates at Putney. It is clear that despite his hostility to a Marxist Historiography Professor Morrill has produced a distinguished body of work. Despite having deep disagreements with the essays, they are a fitting tribute to an outstanding historian. They will be of interest to specialists and students and are written in a style that would be acceptable to the general reading public interested in this period.